Hints to the Cornish Victorian Mine investor. Here is an excellent article written in 1857 by J.R. Leifchild offering his advise to those tempted to risk their money in the Cornish Mining industry. If you have own copy of Webb and Geach, put yourself in the mind of a remote investor, and after reading through this article attempt picking a mine worthy of your hard earned earned cash. 1. Use great caution when a mine is being represented as being capable of being commenced without machinery; or as being able to be wrought with an unusually small amount of capital. 2. Refrain from any mine proposed to be wrought by steam machinery with less capital than £5,000, unless you are fully satisfied by your own personal examination. No mine ought to be undertaken without the possible resource of a surplus capital. Nine out of ten mines which have been cramped for capital have failed. 3. Be cautious when the purser of the mine is a trader or shopkeeper. Mining capital is useful to extend private trade. Look at the Purser well, lest he look to himself too well; lend to him personally rather than inderirectly. 4. Resident shareholders sometimes take shares in a neighbouring project, if it will drain their own mine of water accumulated in it. Beware of projects got up by such gentlemen. 5. Avoid mines of which the traders in supplies have the agency, or in which their special friends are strong and numerous. 6. Avoid mines belonging wholly too non-resident shareholders, and which are left to the unchecked control of the Purser and Captain. 7. Look well to the registry and transfer of shares, if enstrusted to the Purser alone, by means of entries in the cost-book only. 8. Avoid mines of any metal except tin, the leases of which are incomplete, opr have been granted except by th sett and signature of the lord’s agent in the cost book. 9. The repute, skill, and character of the Purser and Capatain of the mine you invest in, are quite as important to you as your skill in your own buisness. 10. Reference to an agent of uncertain character sometimes leads to a depreciation in the concern you are thinking of, and a recommendation of the concern he is thinking of. 11. What exactly suits the views of a mine agent, may not exactly suit yours. 12. It is far easier to put tin into a mine, then to get tin out of a mine; and its is more likely that you will lose £100 then gain £10. 13. To detremine the number of shares you will take in a very promising mine, first consult your wife, then count your children, and lastly, calculate your household expenses. 14. It is just possible that the sample ores you see in London, or some other city, have come from any mine except the one projected or offered to your consideration. Some samples have been known to serve for several mines. 16. Before you invest, do not look over a list of mines whose returns have been extraordinary; but reckon up the failures. Be sure to be particular about these, as they will most concern you. 17. When you have invested, make your mind to loose; and then any gains will be clear gains, and pleasant disappointments. 18. Send the author a ten-pound note for his advice-good in either way. From Cornwall its mines and Miners, 1857, J.R. Leifchild. 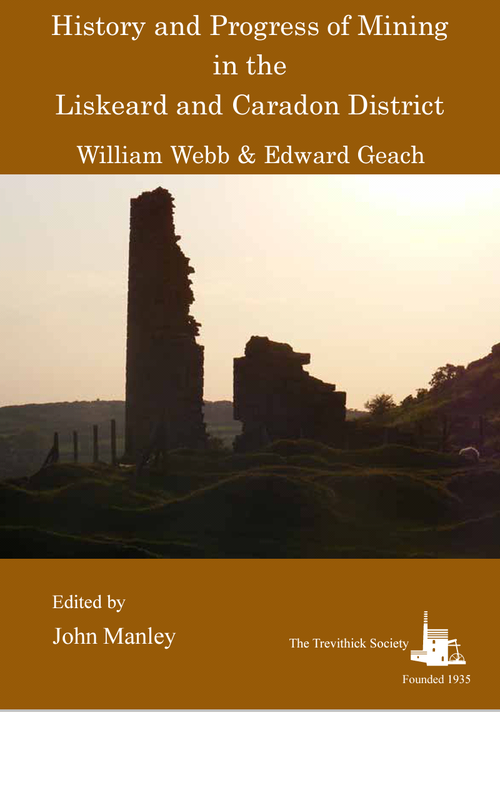 History and Progress of Mining in the Liskeard and Caradon District, 1863, By William Webb, Edward Geach and John Manley. Copies are available in the Liskeard Area from the Bookshop, on the Parade. 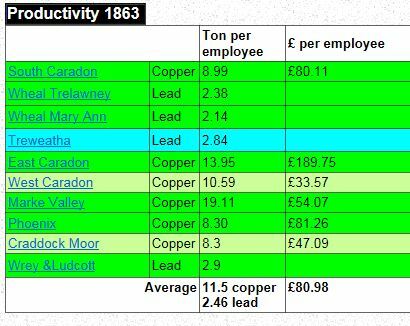 How much did the Caradon Mines produce in 1863? This is the final post of the series explaining some of the facts behind Brenton Symons’ Map of the Liskeard Mining district (1863). In this post it table and charts showing the production and sale of ore. In 1863 a total of 29,844 tons of ore was produced within the area, over 90% of which was copper. Such large figures are hard to visualise, it would have taken just under 5,000 of the Liskeard and Caradon Railway wagons to transport the ore. The equivalent of over 13 wagons a day would have to have left the district by rail or packhorse. Over the year, about two hundred vessels would have needed to call at the ports of Looe or St. Germans to ship the ore to the smelters. 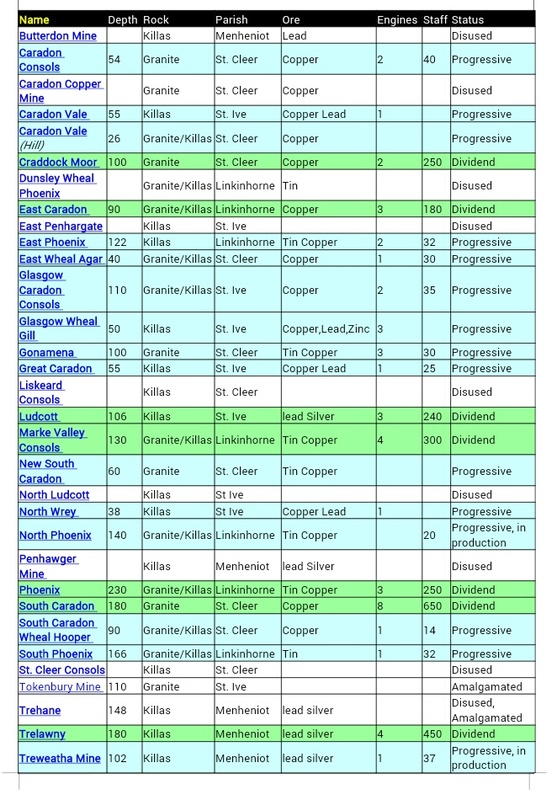 At this time 21% of Cornwall’s copper ore was being produced by these mines , and 42% of its lead. Devon Great Consols just across the border, in England, produced a massive 26,756 tons in the same year. This pie chart shows the tonnage of copper produced in 1863 by the largest mines. On face value it shows a relatively even spread of output between four of the mines. But pure tonnage is deceptive, as the next chart shows. This diagram displays the price per ton of the copper ore. South Caradon’s richness in ore quality is plain to see in these figures. It was this richness that would maintain the mine’s dominance in the area, and make it one of the best performing mines of the decade in Cornwall. East Caradon was relatively new producer in the area in 1863, and it had a high productivity in both tonnage and sales. Marke Valley was known for being “behind the times” in its operation, and yet, it appears to have had a high productivity in respect of ore production. Its lower performance in monetary terms is a reflection the mine’s poor quality of ore.
£50 per employee appears to be the profitability level. Both West Caradon and Craddock Moor Mines struggled to keep dividends in payment, with productivity below this £50 per employee level. 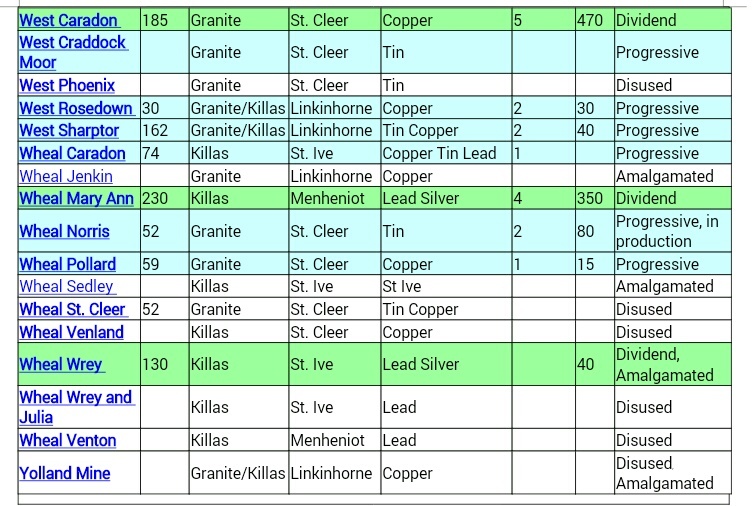 This table shows the price of a ton of copper ore at an assumed “standard” of quality. It gives an indication of the prices mines would receive from their ore sales. The rapid drop in February was a result of the smelters dropping prices after claiming that there was a “smallness of demand”. An upturn occurred later in the year caused by a drought in the copper producing country of Chile, coupled with an increase in demand from the USA. Nothing in this graph forecasted the price plummet that was to hit copper prices in the crash of 1866. Click here to buy the books on my Amazon store. If you are visiting the area, then pop into the Bookshop on the Parade, Liskeard to buy the paperbacks. How deep were the Caradon mines? This diagram displays to scale, the depth of mine workings shown on Brenton Symons’ 1863 map of the Liskeard area, in Cornwall. The units are in fathoms (6 feet). The table at the bottom of the blog lists the mines in order of descending depth. The two deepest workings on the map are Wheal Mary Ann and Phoenix United, both at 230 fathoms (1380 feet, 420 meters), almost a third of a mile deep. For comparison, the Caradon Hill radio mast only stands 130 fathoms above the summit. 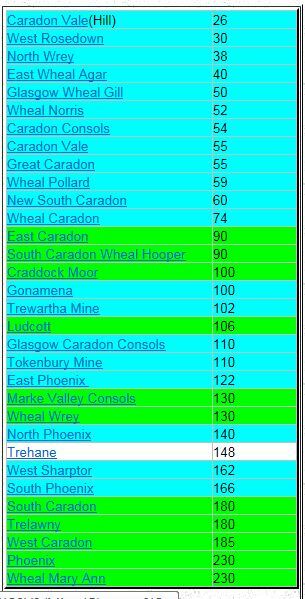 All the dividend paying mines had a depth of between 90 and 250 fathoms, the shallowest being East Caradon Mine. The average depth of the progressive mines was 77 fathoms with the shallowest mine in production being Wheal Norris, at only 52 fathoms. A large number of progressive mines exist around the 50 fathom depth, all being new mines or re-workings started since 1858. 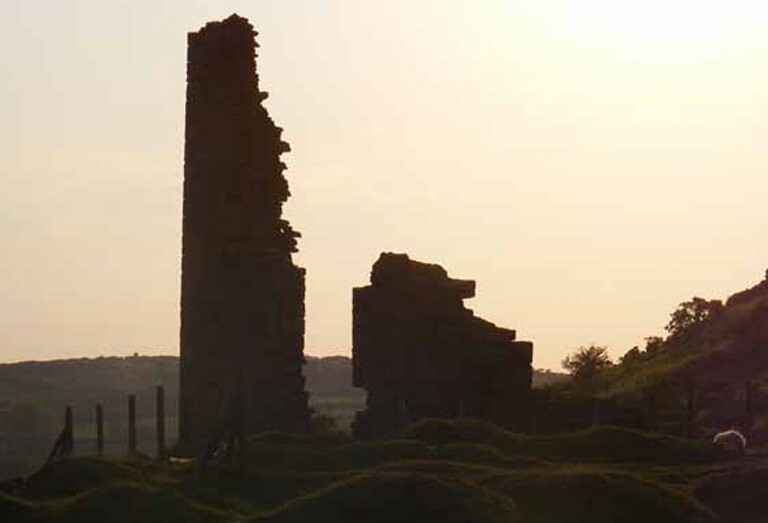 Wheal Norris (WN) is the shallowest mine in production, but it exploited shallow tin reserves to offset the cost of sinking shafts to reach the copper. 90 fathoms was the depth of the first of the dividend paying mines, East Caradon (EC), which was also paying the largest dividends. Below this 90 fathom threshold half of the mines were making a profit, down to the 230 fathoms of Wheal Mary Ann (WM) and Phoenix. (PX). Amidst the deep mines of the area, two stand out as symbols of investor’s optimism or gullibility. South Phoenix (SP) and West Sharptor both continued to demand high calls from its adventurers, and yet no sign of ore had yet been forthcoming. In this table the dividend paying mines are green, and the operational non dividend paying are in blue. The next post in this blog will explore the financial and production figures for the District in 1863. 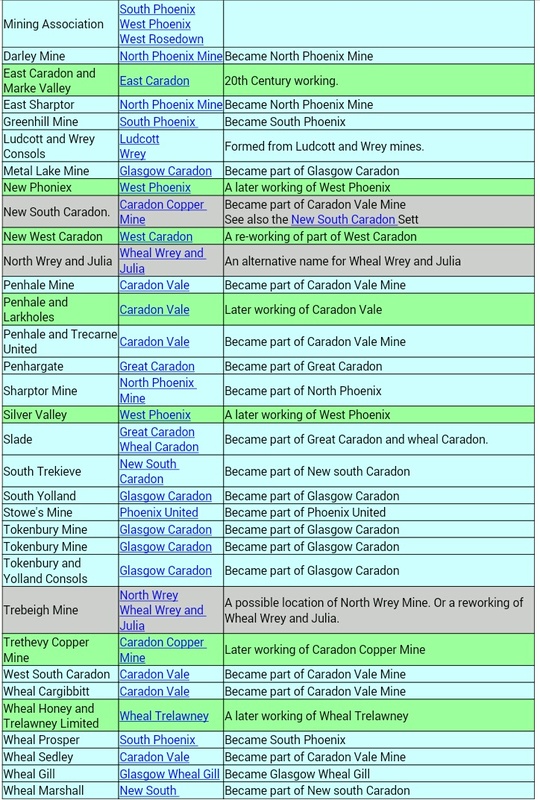 Here is the second set of tables listing the mines of the Caradon mining district of Cornwall. This list contains the names of mines that were not in existence in 1863, and links them with the mines shown on Brenton Symons’ map of that year. The ‘sett’ column gives the name of the 1863 sett, as shown on the map, that the mine was within. Blue rows are pre-1863 mines, green rows are post 1863, and grey rows contain alternative names. For the 1863 listing see the previous post. To download a sample of Brenton Symons’s map from my Amazon store or buy a copy of the Webb and Geach Book click here. If you are in the Liskeard area, then Webb and Geach is available from the Bookshop on the Parade. This is a summary of the mine setts shown on Brenton Symons 1863 Geological map of the Caradon and Ludcott Mining Districts in Southeast Cornwall. The table was originally published the CD-ROM version of the map, but the format was not suitable for the Kindle edition. So here it is as two images. Rock: Granite or killas, where Killas is a general term for metamorphic rock. Engines: the number of winding, crushing and pumping steam engines. Status: The status of the mine in 1863. A Progressive mine is working but not producing ore, a progress in production is a mine producing ore but not yet paying dividends, a dividend mine is one paying dividends to its share holders. 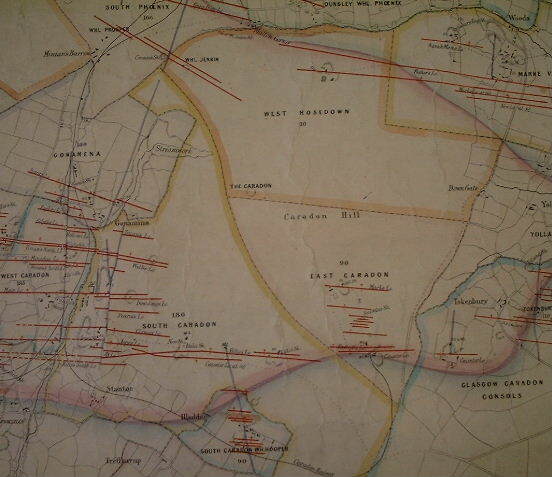 The map showing these mines is available in a Kindle format as part of ‘The Liskeard Mining District in 1863‘. A contemporary description of the mines is contained within ‘The History and Progress of Mining in the Liskeard and Caradon District’ 1863, By William Webb, Edward Geach. This is available as a paperback published by the Trevithick Society. My next post will include the tables of associated mines in the area, that is all the smaller mines that became part of the 1863 setts. To download a sample of Brenton Symons’s map from my Amazon store or buy a copy of the Webb and Geach Book click here. If you are in the Liskeard area, then Webb and Geach is available from the Bookshop on the Parade. If you prefer to buy on line, non-Amazon style, then Mike Moore Books will be able to provide a copy.